Diplomat Jess Turner’s job is to ensure the State visit of the Chinese President runs smoothly. But tensions are running high. Jess uncovers a shocking secret. A British diplomat went missing in Shanghai in 1984 and has never been seen again. All evidence she ever existed vanished with her. Jess soon finds herself in grave danger. Born and educated in the UK, Jean worked as a British diplomat for many years spending her life working overseas in Embassies and High Commissions in Australia, Brussels, the Caribbean, China, East Berlin, Indonesia, Mauritius, and Switzerland. She has travelled extensively and writes about all the countries she had lived in or visited. …… excellent story, beautifully written … Harrod engages the reader with her fast-paced narrative. This is the 3rd in the series and I loved the first 2. So looking forward to reading this one which I have kept wrapped up to enjoy at Christmas. Well done. I have been eagerly awaiting the return of Jess Turner in this third book in the diplomatic crime series. I absolutely loved it. The plot is fast paced and well thought out. It has a brilliantly atmospheric sense of place in the descriptions of Shanghai in the 1980s. The characters are compelling and genuine. The author also gives interesting insights into the working lives of diplomats while working overseas. Overall an enjoyable and intelligent book. My husband and I met Jean Harrod in Helmsley promoting her books and wanting to support thought we would buy one . After reading the first we could nt wait to read on and the 2nd and 3 rd were soon purchased . All three thoroughly enjoyed. Jean tells descriptive stories with interesting characters and her knowledge of the world of the diplomacy adds to the intrigue. Can’t wait for the next one . Jean’s 3rd book in the trilogy, enthralling as ever. Page- turning intrigue, well grounded on Jean’s fascinating diplomatic life. Highly recommend reading all three books. Jess Turner is a riveting protagonist! I first met Jean when she was a speaker at our WI, she is one the most engaging people i have ever met, her books are real page turners, I have thoroughly enjoyed all three & look forward to her next book. I have heard Jean speak on a couple of occasions and have enjoyed both talks very much. Jess is a real hero and I have found all three homepage turners. Can’t wait for the next one. Jean gave me her first book to read and am absolutely hooked. I read Jean’s first book after meeting her at an event in Stokesley, Jean subsequently came and gave a talk to our village book group.She is an excellent speaker and writer, our group have read all three books, all have been voted gripping reads many saying this one the best. Great read, fascinating location and love Jess Turner, can’t wait for the next one. I agree with all comments above. I heard Jean speak at Ripon Inner Wheel meeting and she was so engaging. I bought her 1st book and was hooked. I have read all 3 and can’t wait until the next. Met Jean at our WI when she gave an enthralling account of her life in the Diplomatic Service. 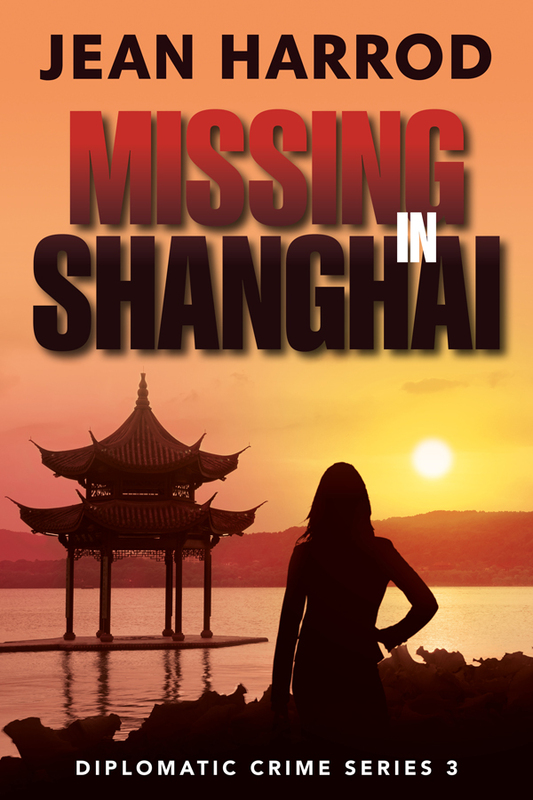 Have read all three of her books in the Diplomatic series and ‘Missing in Shanghai’ was a real page turner – I can’t wait for the fourth book. Jess Turner is a strong, believable character and the mix of diplomatic working fact and Jean’s storytelling is a great mix. Brilliant. Cannot wait for the return of Jess Turner. Having read the first two books in this trilogy, I awaited the third with anticipation. The test of a good book is that you re-read it, I certainly have.